Kalmegh, Kiratatikta, Shigru, Guduchi, Neem Patra, Saptaparni, Shunthi. Pratishyay, jwara, galashotha, swarabheda. Effective formula to cure cold, cough and flu. 1 - 2 Tablets twice a day with lukewarm water. Excellent....i had allergy problem for some time now mainly due to weather. 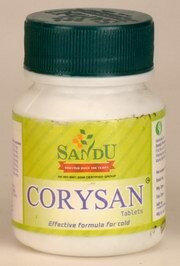 I started this medicine and within days my sneezing and allergy was gone. Its an excellent medicine. Excellent....i had allergy problem for some time now mainly ..